Sorry about the lack of updates the last few days, I just moved into my new place and I just got the internet up and running a few hours ago. Dan and I really appreciate the feedback you guys have been giving us, and we'll do our best to try and upload any requests. Adorable has always baffled me. This is a band that by all rights should have been huge (and at the very least, huge in their native England) but they seemed to come up just short with little to no praise from critics and modest sales of their only two releases. Like many bands that you can look back on years later and really appreciate, Adorable seemed to be the wrong band at the wrong time. 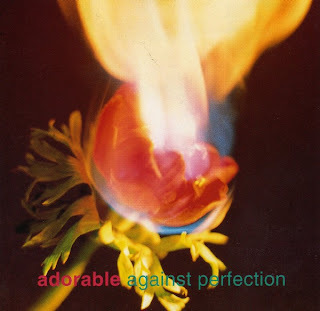 Their debut, Against Perfection, was released at the very tail end of the popularity of the shoegazer scene, and while the album has some fantastic hooks, it certainly lacks the upbeat nature of the britpop bands of the time. Against Perfection is just a flat out good record with an identity crisis of sorts, and had it been released at a different time on a different label, the band would have had a much bigger following. Along with the album, I'm also including a video for the song "Sunshine Smile."